Paul Smart Transport Limited is a family owned and operated haulage company based in Felton near Bristol. 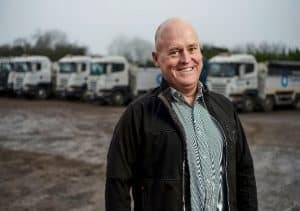 Paul Smart started the business in 1994 with just one truck. Our transport team now operate an expanding fleet of 15 rigid trucks, 17 bulk tippers, 3 bulk walking floor trailers and 3 skeletal trailers transporting aggregates, asphalt, animal feed, grain and containers around the UK. All our vehicles are less than five years old and we are constantly working with Scania to ensure we only put the safest and most modern trucks on the road. 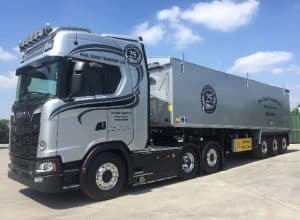 Kate Smart-Cooke, Business Development Manager, explains how Paul Smart Transport Ltd have benefitted from achieving FORS Gold and what FORS means to the company. We came across FORS in 2013 when tendering for work in London and soon became Bronze and then Silver accredited which enabled us to tender for more work, as well as becoming a safer and more efficient fleet. We became FORS Gold accredited a year ago which was a huge achievement for our company. The benefits of FORS have seen us hugely improve the safety of our vehicles, improve our fuel efficiency and reduce our environmental impact. We passed our Gold audit first time round. This was a huge achievement for us and showed us that we fully understood the FORS standard and exactly what FORS aims to achieve. In the past 12 months, we have continued to manage our fuel usage and monitor our emissions output per vehicle and we have continued to educate our drivers on how these areas can be improved through on the job and classroom-based learning. We actively monitor our drivers use of the FORS e-learning available to them and ensure that they complete the cycle safety training every year, as well as attend a Safe Urban Driving Course at every five years at least. We also feel that it is important to train our management team and have three managers who have gained their FORS Practitioner certificate and one manager who has gained their FORS Road Collision Investigator certificate. It has been important for us to maintain FORS Gold as it most importantly, has increased our awareness of vulnerable road user’s safety, resulting in all our trucks being fitted with the latest safety equipment such as side scan, 360° recording cameras, audible left and right turn warnings, Class IV, V and VI mirrors and prominent cyclist safety signage. It has also aided us in gaining work which we wouldn’t have been considered for if we weren’t Gold Accredited. Since becoming FORS Gold, we have seen a decrease in our CO2 output, incidents and PCN’s. We are continually monitoring our fuel efficiency and emissions; we operate two telematics systems side by side which enables us to utilise data more accurately. Through keeping accurate telematic and KPI records, we are able to carry out ongoing progressive, proactive improvements. We currently have a fleet replacement programme in place that is replacing Euro V vehicles with Euro VI vehicles, resulting in lower emissions and reducing our carbon footprint. Through online, classroom and on the job training, we have actively improved our incident rate and number of PCN’s. We have invested over £1.6m into Euro VI trucks in the last 12 months. Driver health and fitness review – at Paul Smart Transport Ltd, all drivers all drivers undergo a comprehensive fitness and health review before they are permitted to operate a vehicle for the first time and then every three years thereafter. We also check driver’s eyesight annually. Strategy for recruiting drivers – we currently recruit using three methods. We use social media, magazine / newspaper adverts and through referrals. Whilst referrals remain the top recruitment strategy, social media is becoming one of our most effective ways of recruiting. Through regular posts, young people are engaging, and we have put two young drivers through an HGV apprenticeship, introducing them into the industry. Noise assessment – since we have introduced a Noise at Work policy and we carry out regular noise assessments, we have significantly reduced the noise levels at our depot. We also issue all drivers with a toolbox talk on reducing noise. All of the quarries our vehicles load from and most of the sites our vehicles deliver to already have noise management plans in place, which our drivers adhere to. Modal shift and alternative vehicles – we operate 32 ton and 44 ton bulk tippers and it is currently not possible to modal shift or have alternative fuelled vehicles. However, we are proud to be working with Scania developing its new generation trucks which are lower in emissions and more fuel efficient. We have operated a masked prototype for over two years, which is the only Scania construction prototype in the UK and has now been launched by Scania as their construction XT range. This development partnership continues with Scania with a further prototype. This is the only vehicle of this type worldwide. During 2018 Paul Smart, the founder of Paul Smart Transport Ltd is celebrating 25 years in business by attempting to raise £250,000 for Cancer Research UK. To conclude, we were proud to maintain FORS Gold accreditation and have become a safer and more efficiently run company. In doing so, we have demonstrated a greater trust to both our customers and to vulnerable road users, showing that Paul Smart Transport take the safety of other road users extremely seriously.